Storytelling branding is one of those essentials without which we can’t imagine modern business. Today, every company, whether it is big or small, tries to demonstrate what is a brand narrative all about. Some businesses craft great stories and make people addicted to their brands. Others – write poor stories, and scare potential buyers away. If you want to know how to write a brand story, just keep reading. In this article, you will find six outstanding product storytelling examples. Also, here you will get useful tips on how to present your brand in an original way. Why did you start your company? Don’t say that you did it because you wanted to earn money and become a millionaire. When building a brand story, you should write about following your passion, your one true calling. Take a look at the following example. 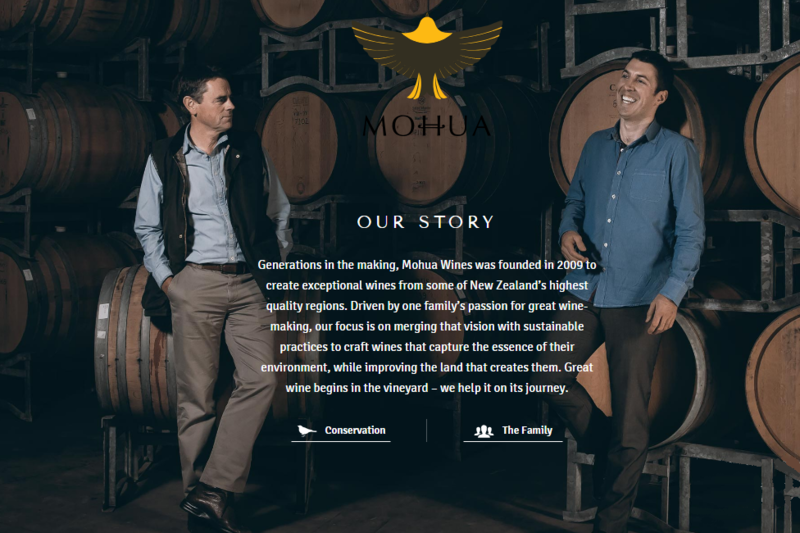 The story of Mohua Wine tells that the creation of the brand began with “one family’s passion for great wine-making”. And all text supports an idea that business owners genuinely love what they do. It’s mentioned that this family considers the production process as a masterpiece creation. If you want to make your target audience emotionally attached to your brand, try your best to create a story like this one. Make people fall in love with your brand and the values you promote. How did you get an idea to start your business? Did something good or bad happen to you and cause changes in your life? Don’t hesitate to share your story with your target audience. If you started your business because you wanted to overcome personal problems, feel free to write about that. People like the honest, heartbreaking stories, so it will help you to win the audience’s attention. 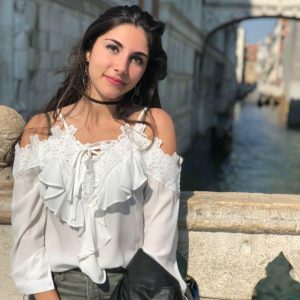 For instance, Unicorn Superfoods’ founders wrote that they decided to start a health-oriented company “after seeing a close family member suffer through cancer”. Don’t be afraid to add statements like this to your story. They don’t scare away but attract the audience. If you want to present your brand in the most favorable light, write about people who stand behind your company. Here is an example. 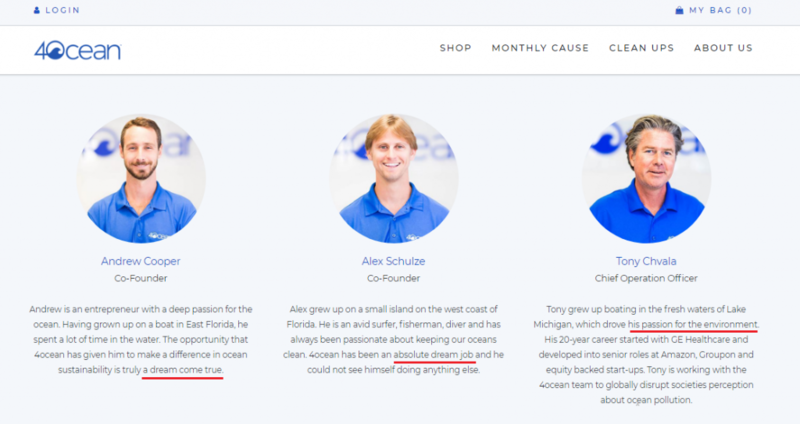 4Ocean is a non-profit organization, which sells bracelets made of recyclable materials, and invests revenue in trash removal from the coastline. The brand story is devoted to the company’s key employees, their lives, experiences, and one dream, which they have in common. Customers like great brand stories similar to this one. They tend to believe that if a company values and respects its employees, it also appreciates its customers. The brand story is a part of the overall content marketing strategy. So, it’s essential to keep your story consistent while crafting and distributing content across multiple channels. Every piece of content should promote the same ideas. 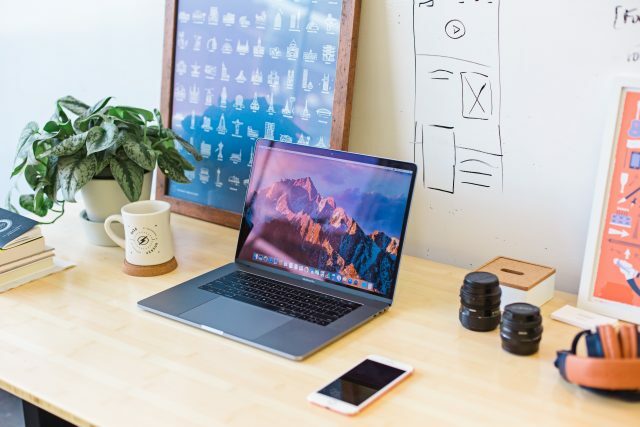 You should set one tone of voice on your website, social media and other platforms. 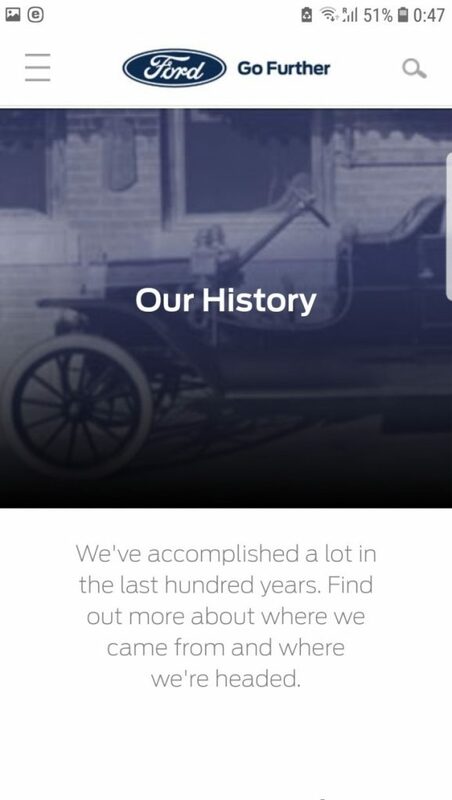 Take a glance at Ford’s website and its Instagram account. Ford is extremely proud of its long history, its achievements, and people, who contribute to business development. As you can see, social media posts complement the brand story published on the corporate website. Creating a brand story, you should write not only about the history of your company but also about your plans for the future. You should show your customers that you have ambitious goals and that you will do your best to achieve them. 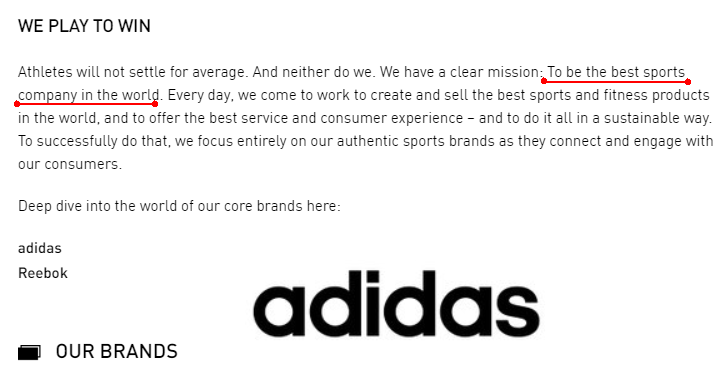 For instance, Adidas aims to be “the best sports company in the world”. And as you know, Adidas is currently heading in the right direction. The higher the goal you set, the higher the results you get. Creating a brand for your business, try to evoke strong positive emotions. The trick is that if you make your brand story heartwarming, you will increase your chances to turn customers into your brand advocates. Here is an example for you. 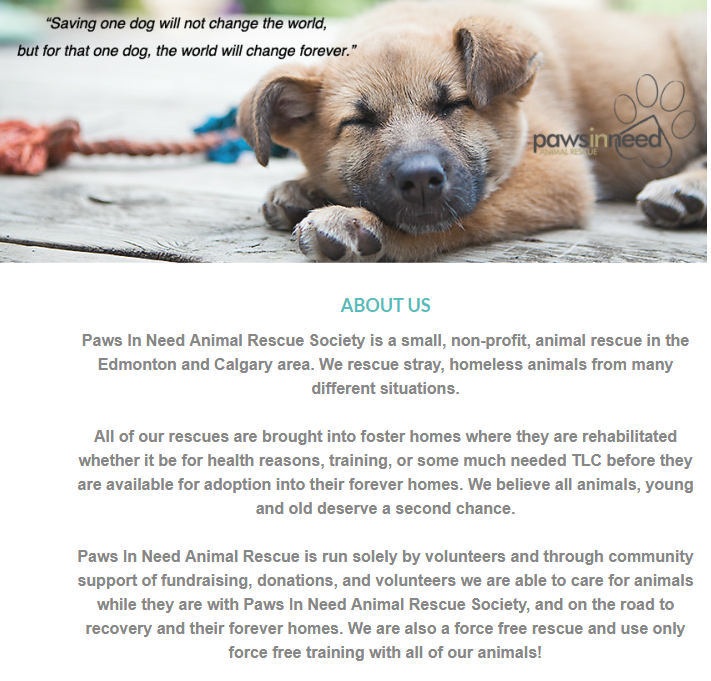 Paws In Need created a powerful message, which cannot leave the target audience indifferent. This story tells about the noble mission of the company and makes readers experience altruism and other strong feelings. Stories like this perfectly suit the charitable and other non-profit organizations. The importance of storytelling for modern business is hard to overestimate. If you haven’t written your brand story yet, try to think about how to make your brand to stand out. Don’t use any templates from the net. Don’t copy brand stories of other companies. Your company is one of a kind, so you should write a worthy story from scratch.